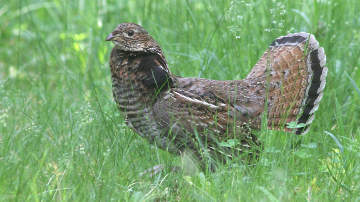 A female ruffed grouse like this one may have 9-12 chicks following her around at this time of year. If a person or a predator approaches, she is likely to fan her tail and neck feathers, as seen here, and create an obvious distraction by calling and acting as if she has a broken wing or other injury as she moves away from the chicks. Ruffed grouse are named for the black ruff of feathers that both males and females have on the sides of their neck. June is a month for many things – strawberries, iris, roses, graduations, and weddings. It’s a time for drivers to watch out for turtles crossing the road to find a sandy spot to lay their eggs. But especially, it’s a wonderful month for baby birds. Well, they’re not exactly babies. What you’re likely to see are young birds that have recently left the nest. Look for them on the water, on the ground, or in the branches. We often think of “leaving the nest” or “fledging” in human terms – as the young leaving home, becoming independent, and no longer needing parental support. But not so fast! Most young birds leave the nest before they can fly well – or even at all – and the parents usually continue to feed them for quite a while. Human parents can relate to that! It’s often easiest to spot young birds on the water. Wood duck ducklings jump down from duck nest boxes (such as those you see at Mill Pond and the ponds at the Fish & Wildlife management area), and then swim after the mother in a line or a group for weeks until they can fly (Aix sponsa, “Make way for ducklings,” June 9, 2006). Mallard ducklings and young geese leave their nests within a day or so of hatching, so you might spot them trailing after a parent in similar fashion. These young can swim and feed themselves, but a parent still leads them to food and protects them by warning them of danger so they can hide and stay still. Adult geese hiss and can be aggressive in defense of their young. Similarly, birds that spend a lot of time on the ground have chicks that can walk, run, and pick up food shortly after hatching. They leave the nest promptly and follow a parent around at least until they can fly, learning where to find food and how to avoid predators. Think of – and look for – killdeer (Charadrius vociferous) and wild turkeys (Meleagris gallopavo, “It’s time to talk turkey,” November 18, 2005). The ruffed grouse (Bonasa umbellus) is also one of these birds. This chicken-like native bird is probably best known as a game bird, and Massachusetts has a hunting season for it in the fall. Adults are about 16-19 inches long with a 2-foot wingspan. In the winter, they may burrow into deep snow overnight. In the spring, males make a muffled drumming sound with their wings to advertise their territory and attract potential mates. They do this by standing on a log and beating their cupped wings. Sometimes called “spring thunder,” the thumping sound starts slowly and gets faster, much like a far-away lawnmower being started. The female builds a nest on the ground, often hidden under a bush or at the base of a tree. She lays 9-12 eggs and raises the young alone. When ruffed grouse chicks hatch, they are quite mobile. They have feathers and can walk and run after their mother and feed themselves. They leave the nest within a day and can make short flights by the time they are 12 days old, although they stay with the mother for 3-4 months, learning where to find food and how to avoid predators. 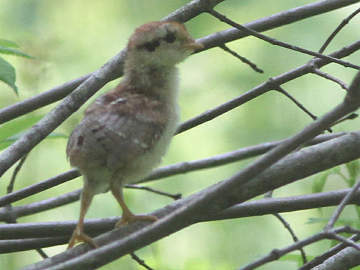 Ruffed grouse chicks have downy feathers when they hatch and leave the nest within a day. After 12 days they can fly short distances, but they usually stay with the mother for 3-4 months. If a predator approaches, the mother often creates a distraction and leads the predator away, calling and acting as if she has a broken wing or other injury. She’ll even do this if you happen to come near the chicks. Watch and listen for ruffed grouse at the Fish & Wildlife management area and Headwaters Conservation Area trails near the Andrews Street entrance. Songbirds and many other birds that we see are a different story: their chicks are quite helpless when they hatch. Some are naked and blind. They need to develop in the nest for days or weeks, protected and fed by their parents. When they leave the nest, they usually can’t yet fly well. Young owls and great blue herons first leave the nest simply by stepping out onto a nearby branch, where they wait for the parents bring them food. Young songbirds often leave the nest by flying to the ground or to nearby branches, urged on by the calls of their parents. If you think birds are nesting in your yard and you hear a great ruckus of calling and flapping, look around – it might be young songbirds leaving the nest. Or if you find a bird on the ground or low in the bushes and it doesn’t fly off as you’d expect it to do when you get near, take a careful look. It might be a recently fledged songbird. Leave it alone and it will probably eventually get up the courage to fly to a more protected place. Most likely, a parent is nearby. Likewise, if you hear a lot of calling and see a lot of flying around in the bushes near your feeder, or in the trees somewhere, watch closely (ideally with binoculars). You might see young birds in the branches, still being fed by their parents. Young birds often beg for food by calling and quivering their wings. The parents may be coming and going with deliveries of insects or food from your birdfeeder. Notice that it takes just an instant for a parent to pass food to a chick’s beak. Young songbirds at this stage are often about the same size as their parents, with camouflaging plumage, but their tail or wing feathers may still be short. You can often recognize them as youngsters by their wing-quivering begging behavior. You can see it without binoculars if you’re on the lookout for it. Why do young birds leave the nest so soon, often before they can fly well (or at all)? One big reason is that the nest becomes a dangerous place when it’s full of young birds. Predators notice the movement, noise, and comings and goings of parents. The young are safer if they’re spread around in the foliage, or hidden among the reeds of a pond. Even so, predators take many young birds. If you watch a family of ducklings, you may find that some of them disappear over the course of several weeks. Another vulnerable time for young birds is just after they become fully independent of their parents. They know how to feed themselves, but they may not be good at it, so there’s danger of starvation. They also lack experience in avoiding predators. In spite of the perils that young birds face, enjoy watching them this month, and appreciate all that they overcome as they grow up quickly and become independent – much as our own children do in their own way.